• PLOT SUMMARY: THE HEROIC AGE IS HERE! A BRAND NEW ONGOING HEROIC AGE TITLE BEGINS HERE! 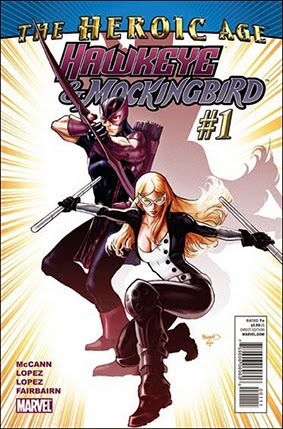 Hawkeye, the world's greatest marksman is back-and reunited with the world's most dangerous super-spy, Mockingbird-in an all-new ongoing series! The deadly duo defied every obstacle to make their way back to each other and put together the all new WCA team-but now the one thing that divided them years before has returned to haunt them: the Phantom Rider! This ancient enemy is out to destroy all our heroes hold dear, and is teaming with Clint Barton's arch-nemesis, the obsessed assassin Crossfire, to do it! Writer Jim McCann and penciler David Lopez, the team behind the acclaimed New Avengers: The Reunion, reunite to aim the spotlight and crosshairs on Marvel's terrorist-targeting tandem, delivering a monthly dose of classic threats, new enemies, shocking allies, unexpected twists and dysfunctional dynamics in the Mighty Marvel Manner! (CA) PAUL RENAUD (W) JIM MCCANN. (A) DAVID LOPEZ.